The summer blockbusters are already hitting theaters, and if you're sane, you're going to go see them in an Imax theater. It's the big screen, only bigger, and more awesome. Now, you can take the IMAGE MAXIMUM experience home with you—provided you've got the guap to buy one of Imax's new pricey custom installs. 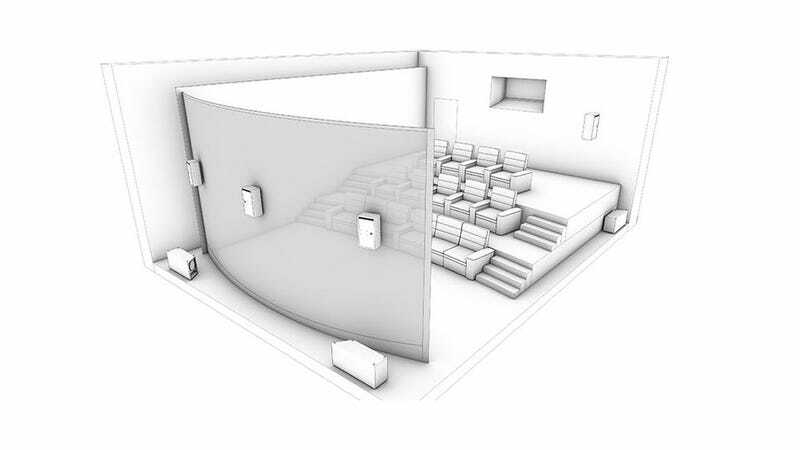 If you buy an Imax Private Home Theater, the company will come to your mansion and design a badass theater from the ground up, from the geometry of the room, to the placement of the seats to the 7.1 channel surround sound, to the floor-to-ceiling curved screen. Imax is offering its private clients technology far superior to what you get at your local multiplex. Instad of the standard Imax projectors with paltry 2K resolution, your custom theater will get dual 4K projectors, one for 2D and one for 3D. This thing looks ill.
Our best guess is that this beast uses the Kodak 4K projection technology Imax bought last year, and will be available to theaters for purchase later this year. The new projectors are good for screens over 120-feet wide. You know, because the standard 71-foot panoramic screen just isn't good enough. And, yes, Imax will constantly monitor your theater to make sure everything's running properly and provide 24-hour support.